Dana Point city staff recognize the need to engage with the city’s residents and have chosen digital platforms to do so for their expedience. Residents may sign up for email notifications at danapoint.org/department/enews-sign-up for all or customized topics, including arts and culture, Doheny Village, neighborhood watch, city council meetings, planning commission, town center, city news, among others. Residents may find information on the city’s website with links for further edification. The city also has a social media presence by which residents may follow the city’s postings to stay informed. One recent addition to city staff’s outreach arsenal is PlaceSpeak, the citizen-engagement platform designed by a privately held Canadian technology company headquartered in Vancouver, British Columbia. 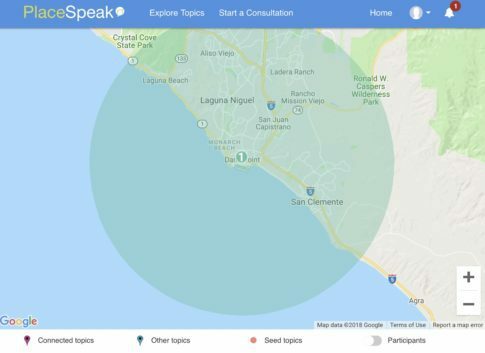 PlaceSpeak, chosen by city staff, allows Dana Point to consult with its residents online within geographic boundaries. It is a quick and inexpensive way to survey residents about their concerns with regard to issues important to the city, according to Councilmember Paul Wyatt. The geolocation feature provides participant authentication, confirming that the participants live in Dana Point, and it also tracks the specific location of the participants, which was consequential to the results of the recent short-term rental survey, the city’s inaugural use of PlaceSpeak. Geolocation indicates how different neighborhoods respond to different topics, thus highlighting demographic concerns. This will be important to future surveys if issues such as homelessness, sober living homes, and commercial development are surveyed because these issues have an outsize impact on specific neighborhoods. PlaceSpeak claims it is committed to participants’ privacy, see www.placespeak.com/en/privacy/; the company complies with Canada’s federal privacy laws and with the European Union’s General Data Protection Regulations, a law that has strict rules on controlling and processing personally identifiable information, and which went into effect on May 25, 2018. PlaceSpeak’s compliance with the aforementioned laws may offer reassurance to participants, who must directly provide personal information, home address and email address, to the platform so that PlaceSpeak can identify and verify participants. PlaceSpeak also indirectly collects participants’ personal information when participants interact with third-party services, such as using a third-party service to log in or sharing content from PlaceSpeak through a third-party social media service. The third-party services will send participants’ information to PlaceSpeak if the participants’ account settings allow such sharing. What a tangled web to weave to civically engage through nonscientific surveys. Participants must have a digital presence, whether through enews access at danapoint.org or through social media platforms, in order to be informed of the survey and to become PlaceSpeak participants. They must feel comfortable providing PlaceSpeak with personal information, though there are preferences for sharing such information on the site. Participants opt-in, it may be presumed, if they are interested in the topic. Mr. Wyatt and Mr. Denny emphasize that the results of the short-term rental survey will be used only to determine the community’s concerns with regard to the topic, which will help the short-term rental subcommittee explore updating applicable regulations but, most important, will not be used to write code. In contrast, “The city is committed to doing a scientific survey at the start of each two-year budget cycle,” says Mr. Wyatt. “Since the city has now moved to priority-based budgeting, getting input from residents is important.” The new budget cycle for fiscal years 2020 and 2021 (July 1, 2019 to June 30, 2021) will begin on September 4, 2018. PlaceSpeak aims to foster civic engagement through polite discourse among named participants in a specific geographic location. Dana Point, though still reviewing the usefulness of PlaceSpeak, plans more surveys so that the city can be informed about its residents’ interests and opinions regarding issues affecting all those who call Dana Point home. I live in Dana Point and have a close relationship with the written word, which is a good thing because I'm a book editor, and I find reading just about anything pleasurable.